Just as the title reads, today (February 21), Mary was spotted on the set of Birds of Prey in Los Angeles filming a scene as her character Huntress. In it, it seems that her character is following Margot Robbie’s character Harley Quinn and actress Ella Jay Basco who plays Cassandra Cain. Head to the gallery to check out the new photos! Two new actresses have been added to the long list of the Birds of Prey cast. First up is actress Charlene Amoia. Amoia, who played Wendy the Waitress in CBS’ How I Met Your Mother, will play Maria Bertinelli, the mother of Mary Elizabeth Winstead’s vigilante the Huntress/Helena Bertinelli and the wife of mafia syndicate gangster Franco Bertinelli. And according to the imdb cast list, Ella Mika will be playing a ‘young Helena Berinelli’ in the film. Additionally, it is being rumored that if Birds of Prey does well at the box office, we could potentially see a spinoff of Mary’s character the Huntress. According to sources close to We Got This Covered, Warner Bros. is developing solo movies for Huntress, Black Canary and Cassandra Cain that could be going into production if Birds of Prey proves a big enough hit at the box office. Additionally, it’s said that Rosie Perez’s character Renee Montoya could be getting the same treatment, too, though this possibility is deemed less likely. This is very exciting news! Can’t wait to see the first trailer for the movie. Birds of Prey (And the Fantabulous Emancipation of One Harley Quinn) will hit theaters on February 7, 2020. 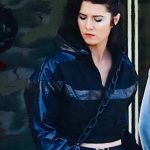 First Photos of Mary on Set of Birds of Prey!! The first photos of Mary on set of Birds of Prey have finally arrived! Mary was spotted Friday night filming a scene as her character Helena Bertinelli/Huntress and was there with her stunt double Hayley Wright. Head to the gallery to check out the huge update featuring 70 behind the scene photos! A gigantic thanks to twitter user bopupdates for the help. Birds of Prey will hit theaters on February 7, 2020 and is directed by Cathy Yan. First Teaser for ‘Birds of Prey’ Released! A production teaser featuring the cast of Birds of Prey has been released and you can watch it below. I’ve also added HQ caps of Mary as her character Huntress from the 20 second clip into the gallery as well. The film will be released into theaters on February 7, 2020. The synopsis for the film is as follows: After splitting up with The Joker, Harley Quinn and three other female superheroes – Black Canary, Huntress and Renee Montoya – come together to save the life of a little girl (Cassandra Cain) from an evil crime lord. Margot Robbie reprises her role as Harley along with Jurnee Smollett-Bell in the role of Dinah Lance/Black Canary, Ewan McGregor as Black Mask, Rosie Perez as Renee Montoya and Chris Medina as Victor Zsasz. Lots of casting news has been released on the upcoming DC film ‘Bids of Prey’. It was recently revealed that Mary’s former co-star Chris Messina, who she worked with on the 2014 film Alex of Venice, has been cast as villain Victor Zsasz, who will be working with Black Mask in the movie. The character of Zsasz is known to carve his victim tally marks into his own flesh. Black Mask is being played by Mary’s former ‘Fargo’ co-star Ewan McGregor. Messina joins Margot Robbie who is reprising her role as Harley Quinn from Suicide Squad, alongside Mary Elizabeth Winstead who is taking on the role of Huntress/Helena Bertinelli while Jurnee Smollett-Bell will play Black Canary. Other casting news includes Steven Williams (The Chi), Derek Wilson, Dana Lee (Dr. Ken), Francois Chau (The Expanse, The Tick) and Matthew Willig (The Ballad of Buster Scruggs). All of those roles are being kept under wraps. Actress Ali Wong has also joined the film and is playing an associate of Renee Montoya in Gotham law enforcement. “Birds of Prey (And the Fantabulous Emancipation of One Harley Quinn)” will be released on Feb. 7, 2020, via Warner Bros. In further casting news for Birds of Prey, it has been announced that Mary’s Fargo co-star Ewan McGregor has joined the DC film as the villain Black Mask. He will join Margot Robbie who is reprising her role of Harley Quinn from Suicide Squad along with Jurnee Smollett-Bell who is playing Black Canary. Rosie Perez is playing Renee Montoya. Black Mask is a Gotham City mob boss aka Roman Sionis who leads the False Face Society gang. In the comics, he killed his wealthy parents in order to take control of their corporation, but he was a terrible businessman and lost everything. He blames others for his shortcomings with Bruce Wayne being one of his targets. In a recent interview this past week, director Cathy Yan confirmed that Birds of Prey will be rated R. The film is scheduled to hit theaters on February 7, 2020.